Sony Studio Monitor Series Headphones- MDRV600/ Designed and Engineered For High End Audio Applications/ Circum-Aural Earcup Design/ Powerful Neodymium Magnets/ 40mm Driver Unit/ Reversible Earcups/ Carrying Case Designed and Engineered for High End Audio Applications. These headphones are garbage plain and simple. I found out too late that these are inferior to the V6s/7506s. Muddy bass, a velied midrange, and a searing treble they are guarenteed to fry your eardrums at even moderate levels. These are to be avoided at all costs. I've already ordered AKGs. PS-- these also, inexplicably, got a 4.5 star avg. rating on Amazon. I use these with my Sony CD player. The sound quality is quite good but rather muddy with classical. Now I'm looking for something better. These cans are noticably heavier than most of the models I have auditioned.The vinyl earcups make your ears sweat after an exetended period of time.Some may find the cord to tangle easily. These headphones provide awsome sound quality for their price.I've used them on various CD players, TV's and DVD players. They seem to pull out details in the sound that cheaper models can't pick up. I recommend these cans for anyone looking to improve their sound experience for a reasonable price. The cord has help up very well and the build quality (see below, though) seems to be OK.
BIG PROBLEM!!! I wear my headphones for many, many hours a day, 7 days a week, and have done so for the last year. The ‘leatherish’ vinyl that covers the foam on the ear cups is GONE, it has dissolved away and it is down to foam. It is fine to use, but really isn’t a sign of quality. In all fairness, I use these things constantly. This is unacceptable on $100 headphones. Overall, they are fine. They would be great for traveling (cover your ears, they fold up into a supplied case) and storage. However, see the weaknesses, if it wasn’t for that, I would give them 5 stars. Cheap Koss's were my last headphones. 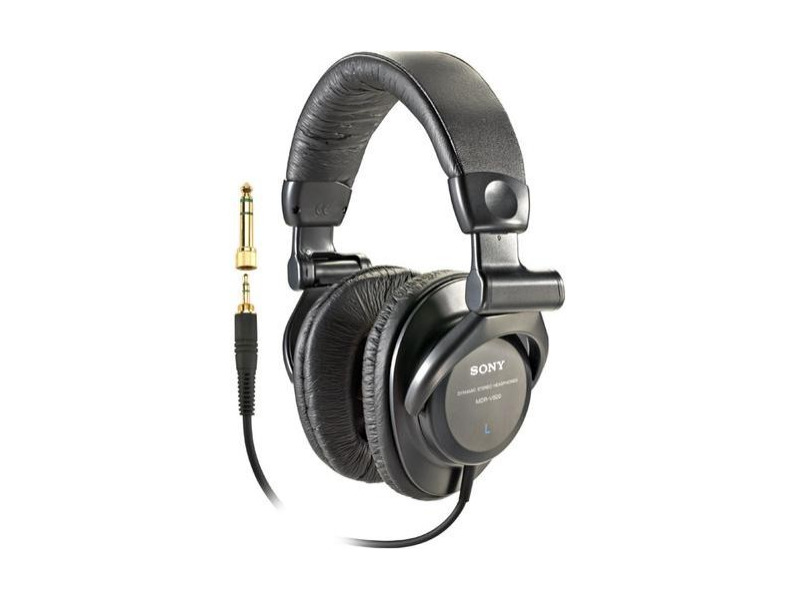 I just had to add my two cents worth about the Sony MDR-V600 headphones. I purchased these headphones many years ago, so I do not know if they are the same version as those that are sold today. They are big and do keep outside noise from being heard, however after 3 hours of constant listening I find that moisture builds up between the cover and my skin. This would be my largest complaint that I have with these cans. They were original bought to improve on the sound quality of cans that come with your higher quality CD walkman. Also they are also the best cans that I own at this time so any comparsion that are made to cheaper headphones is not really far. These cans greatly improved the sound over what came with the CD walkman, better bass, midrange and high end. So I was quite happy for what they where purcahsed for. One piece of plastic has broken off with all there use and this was easily fix with some glue, so they have been durable. No computer that I have used with these headphones have matched or been better than the Sony Walkman that I use them with, close but not better. However none of these computers had a high end sound card and actually I do not believe it really matters as no matter how good the sound card is the CD is still the same. Recently I purchased a Mapletree Audio Design (MAD) tube headphone amplifier the Ear++ and connected it directly to my Ah Njoe Tjoeb 4000 CD player. Let me first say, have we every been missing a lot of the music. This combination was unbeliveable in its sound from the very start. From solid lows, that are only present when it is actually present in the music through the mid range and right up to the high end the Ah CD player never sounded so good. Symbal crashes where clear, distinct silky smooth and so clear and real. Pianos which I have always found the hardest for any stereo to reproduce where so accurate and life like that I could not believe that I was listening to the same cans. Soundstage and imaging has never been better, micro detail and resolution was the best that I have every heard from the Sony cans. So I quickly realized that these cans where being held back by the source and amplification that was available previously. In fact the next speakers that I have recently ordered have large shoes to fill and the Musical Fidelity A300 intregrated amplifier might not do anymore because the little MAD Ear++ has opened my ears to the power of tubes. So for those that are lucky enough to be able to afford a fairly good CD player I would recommend getting a headphone amplifier as well. There is no comparsion from the Ah headphone jack and to that on the Ear++. So although I have paid more money than most people have for these cans, I would to tell people give them a try but use a good source and a dedicated headphone amplifier such as the Ear+. I have found that this combination gives excellant sound quality at all volume levels, but they do preform better with some power being used. Just like the computer industry it turns out that in Audio field it is the same. Garbage in garbage out. Although, even with lower quality equipment these cans sound resecptable, they preform there best with higher end equipment, do not blame the cans for muddy bass as it is most likely other equipment that you are using. Although I did not give them 5 stars, as I usually reserve this for the very best in value and sound. A solid 4.5 would be an accurate rating in my eyes and ears, I do not believe that I would every give straight 5 stars. Even the Ear++ and Ah CD do not rate straight A+'s but I would rate them above 4.5 but not 5's. Maybe I am just a cheap Dutchman that is asking for to much of a deal. I just got the Sony MDR-V600 the other day and so far I love them. I wanted to invest in a good pare of headphones for gaming and these seem to be great. Great accuracy & clarity at all frequencies. Fairly comfortable. I am an employee at Best Buy, so I occasionally make an impulse purchase. This was not one of those purchases. I wanted a set of cans so that I could watch movies, play games, and listen to music late at night with a good sound at a fairly high volume. I've never been impressed much with either Bose or Sony, but as with all products, I gave their headphones a chance. Like most other Bose products, the cosmetics/comfort/ease were great, but it didn't put out the highs and lows I was looking for. The best ones we had were the Sony's of the next step up, but they were 150 retail (25 more than the 600's on my discount) I was a little dissapointed with these at first, but it didn't take me long to realize that it was just my source (mp3s from my computer) I've now got them hooked up to my Kenwood stereo receiver and Denon CD player. They sound absolutely fantasic. I don't have nearly as much music on CD as mp3, but I haven't listened to my mp3s in a week because I enjoy listening to this so much. They put out accurate, crisp highs, great punchy lows, and clear, vivid mids. These are great headphones, but make sure you're coming from a good source. Very comfortable, nice long cable 9 ft coiled, price, excellent sound! small storage size for closed headphones. have to turn volume settings way up with pc sound card use. After careful review and comparisons. I selected these for their quality, features, and price. I use them mainly for PC music and gaming. And also for DVD music and movies. Read the other positive reviews for their sound qualities and features. blocks the outside noise. Doesn't hurt ears. poor bass. Too expensive for the performance. I'm just an amature, but I have used several headphones in search for the "perfect" one. For $100 these headphones are not good at all. I returned them the next day of their purchase. I use the headphones with my computer which is equiped with a very good sound card. It's as if the headphones can't keep up. The bass is not strong enough (again..for $100).